Having been very quiet so far this year VOSA has seen a lot of activity this last few days. On the site on the 6th February we have the following notifications. I know this is very much a Plymouth based blog but today I will just show the Cornish notifications as it highlights the impact on public transport of the Cornwall County Council cuts. It is to be hoped that there are a few more new service registrations to appear to replace some at least of the cancellations listed below. Otherwise things will be really grim! Variation Accepted by SN: Operating between PENZANCE, Bus Station/ FALMOUTH, Moor and HELSTON, Tesco given service number 2/2A effective from 01-Apr-2012. To amend Route and Timetable. Variation Accepted: Operating between PENZANCE Bus Station and LANDS END given service number 1/1A effective from 01-Apr-2012. To amend Timetable. Variation Accepted: Operating between PENZANCE, Bus Station/ FALMOUTH, Moor and HELSTON, Tesco given service number 2/2A effective from 01-Apr-2012. To amend Route and Timetable. Variation Accepted: Operating between PENZANCE Bus Station and GWAVAS/MOUSEHOLE given service number 5/5A/6/6A effective from 01-Apr-2012. To amend Route and Timetable. Variation Accepted: Operating between FALMOUTH Moor and TRURO Treliske Hospital/NEWQUAY Bus Station given service number 68/68A/88/88B/89/90/988/989 effective from 01-Apr-2012. To amend Route and Timetable. Cancellation Accepted: Operating between ST AUSTELL Bus Station and Megavissey given service number 26 effective from 01-Apr-2012. Registration Accepted Starting Point: Penzance Finish Point: Manor Way Via: Service Number: 11 Service Type: Normal Stopping Effective Date: 01-APR-2012 Other Details: Hourly, Monday to Saturday, except public holidays. Registration Accepted Starting Point: Penzance Finish Point: St Ives Via: Gulval Service Number: 16 Service Type: Normal Stopping/Hail & Ride Effective Date: 01-APR-2012 Other Details: Hourly Monday to Saturday except public holidays. Variation Accepted: Operating between TRURO and NEWQUAY BUS STATION given service number 592/594/595/597 effective from 01-Apr-2012. To amend Timetable. Variation Accepted: Operating between NEWQUAY Bus Station and PADSTOW Old Rail Station given service number 556 effective from 01-Apr-2012. To amend Timetable. Variation Accepted: Operating between TRURO,Victoria Square and NEWQUAY, Bus Station given service number 585/583/587 effective from 01-Apr-2012. To amend Timetable. Variation Accepted: Operating between St Austell and Bodmin Morrisons given service number 529 effective from 01-Apr-2012. To amend Route and Timetable. Variation Accepted: Operating between Bodmin and PADSTOW Old Railway Station given service number 555 effective from 01-Apr-2012. To amend Timetable. Variation Accepted: Operating between St Austell and Gorran Haven given service number 526 effective from 01-Apr-2012. To amend Route and Timetable. Cancellation Accepted: Operating between BUDE Strand and MARHAM Church given service number 518 effective from 02-Apr-2012. Variation Accepted: Operating between BUDE, THE STRAND and Holsworthy given service number 530 effective from 02-Apr-2012. To amend Timetable. Variation Accepted: Operating between Newquay Bus Station and Eden Project given service number 527 effective from 01-Apr-2012. To amend Route and Timetable. Variation Accepted: Operating between St Agnes and St Ives Malakoff given service number 547 effective from 01-Apr-2012. To amend Timetable. Variation Accepted: Operating between NEWQUAY and ST AUSTELL given service number 521 effective from 01-Apr-2012. To amend Route and Timetable. Variation Accepted: Operating between LISKEARD and CALLINGTON given service number 574 effective from 02-Apr-2012. To amend Timetable. Variation Accepted: Operating between St Columb Major and Boscastle given service number 594 effective from 01-Apr-2012. To amend Timetable. Cancellation Accepted: Operating between Penzance Bus Station and St Just, Bus Station given service number 516 effective from 01-Apr-2012. Variation Accepted: Operating between Penzance Bus Station and St Just Bus Station given service number 504 effective from 02-Apr-2012. To amend Timetable. Cancellation Accepted: Operating between Penzance Bus Station and Panzance Manor Way given service number 511 effective from 01-Apr-2012. Cancellation Accepted: Operating between NEOT and MENHENIOT given service number 575 effective from 01-Apr-2012. Variation Accepted: Operating between St Austell Trinity Street and Fowey Safe Harbour given service number 524/525 effective from 01-Apr-2012. To amend Route and Timetable. Variation Accepted: Operating between Truro BHS Boscawen St and Truro BHS Boscawen St given service number 596 effective from 02-Apr-2012. To amend Timetable. Variation Accepted: Operating between St Austell Trinity Street and Truro (Boscawen Street) given service number 522 effective from 02-Apr-2012. To amend Route and Timetable. Cancellation Accepted: Operating between Truro Bus Station and Helford Passage given service number 500 effective from 01-Apr-2012. Variation Accepted: Operating between Truro, Boscawen Street and St Mawes Car Park given service number 550/551 effective from 01-Apr-2012. To amend Timetable. Cancellation Accepted: Operating between St Austell, Bus Station and Lostwithiel given service number 523 effective from 01-Apr-2012. Cancellation Accepted: Operating between St Austell, Trinity Street and Stenalees given service number 528 effective from 01-Apr-2012. Variation Accepted: Operating between Penzance Bus Station and Lands End given service number 501 effective from 01-Apr-2012. To amend Timetable. Cancellation Accepted: Operating between Helston Tescos and Lizard Green given service number 537 effective from 01-Apr-2012. Cancellation Accepted: Operating between Helston and St Keverne/Coverack given service number 538 effective from 01-Apr-2012. Cancellation Accepted: Operating between Truro Victoria Square and Camborne Bus Station given service number 540/542/543 effective from 01-Apr-2012. Variation Accepted: Operating between Truro, Boscawen Street and St. Austell, Kings Avenue given service number 520 effective from 01-Apr-2012. To amend Route and Timetable. Cancellation Accepted: Operating between Helston Coinagehall Street and Falmouth Moor given service number 535 effective from 01-Apr-2012. Cancellation Accepted: Operating between Camborne Bus Station and Truro Bus Station given service number 543 effective from 01-Apr-2012. Cancellation Accepted: Operating between Redruth Railway Station and Helston given service number 534 effective from 01-Apr-2012. Cancellation Accepted: Operating between Truro Railway Station and Helston given service number 582 effective from 01-Apr-2012. Variation Accepted: Operating between Callington New Road and St Neot Car Park given service number 283 effective from 02-Apr-2012. To amend Route, Stopping Places and Timetable. Registration Accepted Starting Point: Launceston, Westgate Street Finish Point: Liskeard Station Via: Upton Cross Service Number: 236 Service Type: ail & Ride Effective Date: 02-APR-2012 Other Details: Monday to Friday except bank holidays. There are a few notifications closer to home – these will appear here tomorrow – as its now 1am and I want to go to bed! These will be either changes to commercial routes or change of operator on supported routes, as there are to be no changes to supported services for two years following the climbdown by CC last month. 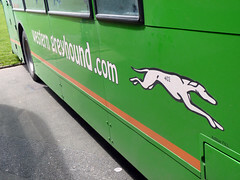 First have won some tenders down that way from Western Greyhound, they will start running them from April. It'a a pity First could not win some of the Plymouth tenders from Target, i.e the 14 and 39... and bring back the Sunday 82 Transmoor link as well!! Do Plymouth tenders come up in April too ??? ?